At the start of this year, Mr Davies put on his usual creative hat and started thinking about how and what we could do in support of the school charity, Birmingham Children’s Hospital. Now the one thing that I have come to realise, is that Mr Davies rarely dreams small, he invariably goes large and then goes that one step further! 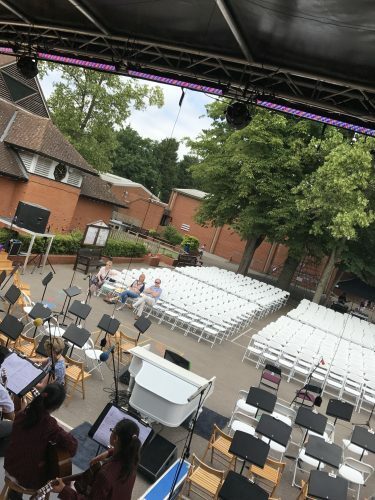 An outdoor concert, 400-500 seats, transform the courtyard with sound and light to create a ‘Last Night at the Proms’ vibe…easily said, so many other aspects to consider! I walked into the Courtyard to find a vast stage rig, sound engineers and a lighting crew working around staff throwing up bunting, the OFA putting bottles of bubbly on ice, strawberries and cream and 100s of chairs to simply transform our playground space into the event of the year…and probably decade. I dare say that having spoken to Mr Elliott, a former head of Orley, that this was the single biggest and most ambitious musical event that the school has hosted. I am not going to be able to do the evening justice in words…if you failed to get a ticket or couldn’t turn up for whatever, reason, you missed out one something extraordinary…speak to someone who attended! I have been inundated with emails and letters from parents who were transfixed, in awe and taken to place of wonder for a few short hours on a balmy summer’s evening. I am confident that every person there put their phones on pause, closed their eyes and could have been at an evening event that you would give your eye teeth to attend. Thank you Ceri for sowing a seed, thank you support staff, The OFA and parents for providing the warmth, water, oxygen and sunlight for that seed to germinate and grow, thank you to Miss Toyn for nurturing that growth to allow it to blossom and from great DNA, comes amazing fruit, thank you to the current and former pupils for giving wings to your talent allowing a humble courtyard to become a place filled with wonder, joy and love! I am afraid that this was the first event that I failed to to take a photo – I was simply too captivated! Thank you Mrs Gossain and Mrs Whitham for sending the attached through…!